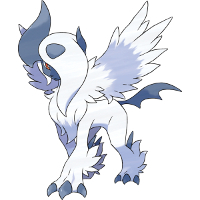 The Mega Evolution of Absol increases its Attack and Speed stats. It also gains the Magic Bounce ability, which reflects status-changing moves. Its wing-like fur stands up from the increased energy caused by Mega Evolution.